As this year Lok Sabha Elections and Indian Premier League (IPL) are going hand in hand, there is a tense of elections and excitement of T20. 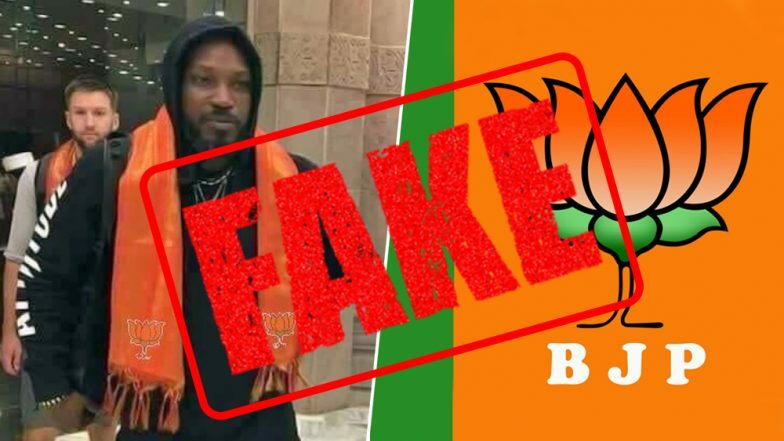 Along with all this, a photo in social media is going viral claiming that the Caribbean beast, Chris Gayle, has reached India to campaign for the Bharatiya Janata Party (BJP) ahead of national polls. In the clip, the universal boss can be with saffron scarf with BJP symbol. LatestLY fact check team has found that the pics going viral on the internet are fake. The manipulated posts along with photos are old, dated back to April last year. These images of Jamaican cricketer have nothing to do with the BJP. VIVO IPL 2019: 5 Funniest Moments in the History of Indian Premier League. Why is the Photo Doing Rounds and Why is it a Propaganda? The photo in question is being shared with messages for political gains. 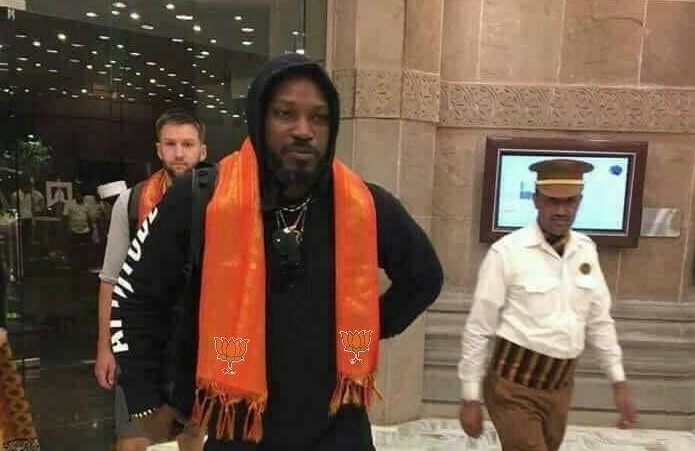 Several netizens are spreading the rumour that Chris Gayle is campaigning for BJP. 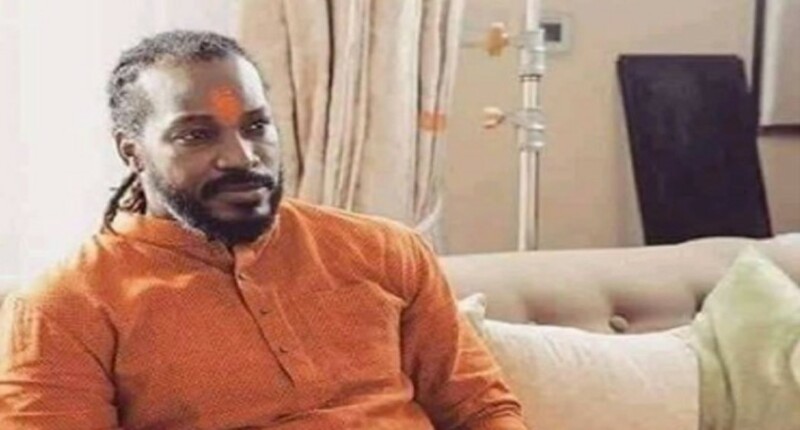 One similar post claimed that Chris Gayle has joined BJP and will support the Ram mandir cause in IPL. In the original photo shared by Chris Gayle, he can be seen wearing an orange stole. But it did not had any BJP symbol. The same photo, morphed with two BJP symbols claims that he has joined BJP. Did American Cartoonist Ben Garrison Create the Cartoon Disparaging BJP and Congress? Earlier, a similar fake post showing Gayle wearing saffron kurta and tilak went viral with a similar claim. The original photo, without tilak, was taken by clothing brand Manyavar in April, 2018. With the caption, "Check out Kings XI Punjab superheroes looking fabulous in our latest collection. Share with us your favourites." The Fact: The truth of the photo is far from what is being claimed. Though the people are sharing it with a claim that Gayle is campaigning for BJP. But there are no credible news reports saying that the Kings XI Punjab player would campaign for the BJP. Conclusion: On inspection, the photo has proved to be fake because the cricketer has no political relations in India. It is clear that the photo is work of malicious imagination in order to gain political advantage ahead of the 2019 general polls. On inspection, the photo has proved to be fake because of the cricketer has no political relations in India.